Microsoft Azure SQL Database enables a subset of dynamic management views to diagnose performance problems, which might be caused by blocked or long-running queries, resource bottlenecks, poor query plans, and so on. This topic provides information on how to detect common performance problems by using dynamic management views. For detailed information on dynamic management views, see Dynamic Management Views and Functions (Transact-SQL) in SQL Server Books Online. In an instance of on-premises SQL Server, dynamic management views return server state information. In SQL Database, they return information regarding your current logical database only. FROM(SELECT query_stats.query_hash, SUM(query_stats.cpu_time) 'Total_Request_Cpu_Time_Ms', SUM(logical_reads) 'Total_Request_Logical_Reads', MIN(start_time) 'Earliest_Request_start_Time', COUNT(*) 'Number_Of_Requests', SUBSTRING(REPLACE(REPLACE(MIN(query_stats.statement_text), CHAR(10), ' '), CHAR(13), ' '), 1, 256) AS "Statement_Text"
Once you identify the problematic queries, it's time to tune those queries to reduce CPU utilization. If you don't have time to tune the queries, you may also choose to upgrade the SLO of the database to work around the issue. For data file IO issues (including PAGEIOLATCH_SH, PAGEIOLATCH_EX, PAGEIOLATCH_UP). If the wait type name has IO in it, it points to an IO issue. If there is no IO in the page latch wait name, it points to a different type of problem (for example, tempdb contention). For transaction log IO issues. Use the sys.dm_exec_requests or sys.dm_os_waiting_tasks to see the wait_type and wait_time. Use the following query to identify data and log IO usage. If the data or log IO is above 80%, it means users have used the available IO for the SQL DB service tier. Option 2: Identify and tune the queries consuming the most IO. When identifying IO performance issues, the top wait types associated with tempdb issues is PAGELATCH_* (not PAGEIOLATCH_*). However, PAGELATCH_* waits do not always mean you have tempdb contention. This wait may also mean that you have user-object data page contention due to concurrent requests targeting the same data page. To further confirm tempdb contention, use sys.dm_exec_requests to confirm that the wait_resource value begins with 2:x:y where 2 is tempdb is the database id, x is the file id, and y is the page id. Use the following query to identify long running transactions. Long running transactions prevent version store cleanup. If your top wait type is RESOURCE_SEMAHPORE and you don't have a high CPU usage issue, you may have a memory grant waiting issue. mg.request_time,                                      --Date and time when this query requested the memory grant. mg.required_memory_kb / 1024.0 AS required_memory_mb, --Minimum memory required to run this query in megabytes. mg.timeout_sec,                                       --Time-out in seconds before this query gives up the memory grant request. mg.resource_semaphore_id,                             --Non-unique ID of the resource semaphore on which this query is waiting. mg.wait_time_ms,                                      --Wait time in milliseconds. NULL if the memory is already granted. -- Calculates the size of the database. -- Calculates the size of individual database objects. When executing the sys.dm_exec_requests and sys.dm_exec_sessions views, if you have VIEW DATABASE STATE permission on the database, you see all executing sessions on the database; otherwise, you see only the current session. You can monitor resource usage using SQL Database Query Performance Insight and Query Store. You can use the sys.dm_db_resource_stats view in every SQL database. The sys.dm_db_resource_stats view shows recent resource use data relative to the service tier. Average percentages for CPU, data IO, log writes, and memory are recorded every 15 seconds and are maintained for 1 hour. For other queries, see the examples in sys.dm_db_resource_stats. The sys.resource_stats view in the master database has additional information that can help you monitor the performance of your SQL database at its specific service tier and compute size. The data is collected every 5 minutes and is maintained for approximately 14 days. This view is useful for a longer-term historical analysis of how your SQL database uses resources. 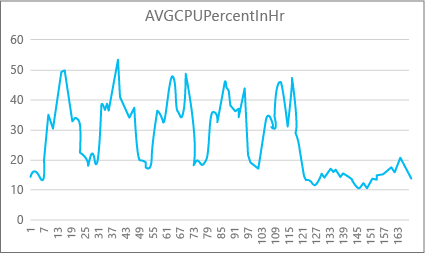 The following graph shows the CPU resource use for a Premium database with the P2 compute size for each hour in a week. This graph starts on a Monday, shows 5 work days, and then shows a weekend, when much less happens on the application. From the data, this database currently has a peak CPU load of just over 50 percent CPU use relative to the P2 compute size (midday on Tuesday). If CPU is the dominant factor in the application’s resource profile, then you might decide that P2 is the right compute size to guarantee that the workload always fits. If you expect an application to grow over time, it's a good idea to have an extra resource buffer so that the application doesn't ever reach the performance-level limit. If you increase the compute size, you can help avoid customer-visible errors that might occur when a database doesn't have enough power to process requests effectively, especially in latency-sensitive environments. An example is a database that supports an application that paints webpages based on the results of database calls. Other application types might interpret the same graph differently. For example, if an application tries to process payroll data each day and has the same chart, this kind of "batch job" model might do fine at a P1 compute size. The P1 compute size has 100 DTUs compared to 200 DTUs at the P2 compute size. The P1 compute size provides half the performance of the P2 compute size. So, 50 percent of CPU use in P2 equals 100 percent CPU use in P1. If the application does not have timeouts, it might not matter if a job takes 2 hours or 2.5 hours to finish, if it gets done today. An application in this category probably can use a P1 compute size. You can take advantage of the fact that there are periods of time during the day when resource use is lower, so that any "big peak" might spill over into one of the troughs later in the day. The P1 compute size might be good for that kind of application (and save money), as long as the jobs can finish on time each day. Azure SQL Database exposes consumed resource information for each active database in the sys.resource_stats view of the master database in each server. The data in the table is aggregated for 5-minute intervals. With the Basic, Standard, and Premium service tiers, the data can take more than 5 minutes to appear in the table, so this data is more useful for historical analysis rather than near-real-time analysis. Query the sys.resource_stats view to see the recent history of a database and to validate whether the reservation you chose delivered the performance you want when needed. You must be connected to the master database of your SQL Database server to query sys.resource_stats in the following examples. Based on your database service tier, you can decide whether your workload fits into the lower compute size. If your database workload objective is 99.9 percent and the preceding query returns values greater than 99.9 percent for all three resource dimensions, your workload likely fits into the lower compute size. The average CPU is about a quarter of the limit of the compute size, which would fit well into the compute size of the database. But, the maximum value shows that the database reaches the limit of the compute size. Do you need to move to the next higher compute size? Look at how many times your workload reaches 100 percent, and then compare it to your database workload objective. If this query returns a value less than 99.9 percent for any of the three resource dimensions, consider either moving to the next higher compute size or use application-tuning techniques to reduce the load on the SQL database. This exercise also considers your projected workload increase in the future. For elastic pools, you can monitor individual databases in the pool with the techniques described in this section. But you can also monitor the pool as a whole. For information, see Monitor and manage an elastic pool. This is just a snapshot at a single point in time. To get a better understanding of your workload and concurrent request requirements, you'll need to collect many samples over time. You can analyze your user and application patterns to get an idea of the frequency of logins. You also can run real-world loads in a test environment to make sure that you're not hitting this or other limits we discuss in this article. There isn’t a single query or dynamic management view (DMV) that can show you concurrent login counts or history. If multiple clients use the same connection string, the service authenticates each login. If 10 users simultaneously connect to a database by using the same username and password, there would be 10 concurrent logins. This limit applies only to the duration of the login and authentication. If the same 10 users connect to the database sequentially, the number of concurrent logins would never be greater than 1. Currently, this limit does not apply to databases in elastic pools. If you're analyzing an on-premises SQL Server workload, modify the query to focus on a specific database. This query helps you determine possible session needs for the database if you are considering moving it to Azure SQL Database. Again, these queries return a point-in-time count. If you collect multiple samples over time, you’ll have the best understanding of your session use. For SQL Database analysis, you can get historical statistics on sessions by querying the sys.resource_stats view and reviewing the active_session_count column. Slow or long running queries can consume significant system resources. This section demonstrates how to use dynamic management views to detect a few common query performance problems. An older but still helpful reference for troubleshooting, is the Troubleshooting Performance Problems in SQL Server 2008 article on Microsoft TechNet. The following example returns information about the top five queries ranked by average CPU time. This example aggregates the queries according to their query hash, so that logically equivalent queries are grouped by their cumulative resource consumption. Slow or long-running queries can contribute to excessive resource consumption and be the consequence of blocked queries. The cause of the blocking can be poor application design, bad query plans, the lack of useful indexes, and so on. You can use the sys.dm_tran_locks view to get information about the current locking activity in your Azure SQL Database. For example code, see sys.dm_tran_locks (Transact-SQL) in SQL Server Books Online. An inefficient query plan also may increase CPU consumption. The following example uses the sys.dm_exec_query_stats view to determine which query uses the most cumulative CPU.